At the start, Bird would only ask for chargers to pick up a scooter at night and every night, all scooters would be picked up. 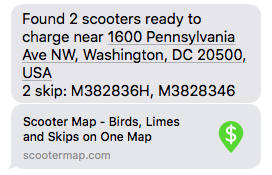 As there are now more scooters and batteries have improved, Bird, Lime, and Skip are making scooters available to pick up throughout the day. That means that if you want to pick up all scooters on your block, you need to be checking all of the different scooter company apps every few minutes. This is super tiring. That’s why you can track a location and get push notifications when scooters show up nearby using Scooter Map. To set up push notifications, you will need to sign up for an account and become a Super Charger (we have a free 7 day trial). Find this section on your profile. Once you have set up a tracked location, Scooter Map will monitor that area. If a scooter that we haven’t seen in the past half hour shows up on the map, we will send you a push message with the scooter ID and a link that shows the location of the scooter. Example of message when scooters are ready to charge. I hope, I want to believe in this notification service! But, I’ve got a big problem. And it’s probably that I’m not using it correctly, but I kind of had to make it up as I went along. I can’t get the notifications to trigger. What is the radius? There is a lot of confusion here on my end. I ended up getting frustrated and added about 9 buildings addresses, and activated them. These buildings are all in high traffic areas at the university down the street from me. I pick scooters up there all the time. The notifications have not triggered for me a single time, unfortunately. Seems to me the radius the app uses to ‘see’ the scooter isn’t big enough by a long shot.. Am I dead wrong? Right now the radius is 800m. Can you email support@scootermap.com with your User ID and email?